Actuonix Motion Devices is proud to announce the launch of our new line of actuators, the T16 track actuator or as we call them around here "tracktuator". As the newest member of the Actuonix family of products, the T16 has been designed to push the boundaries of automation and highlights our company's commitment to leadership and innovation in the micro-motion marketplace. We have designed and engineered this new line of products specifically to meet the growing demand for tiny actuators across a wide variety of industries. With it's shorter overall length and side-load tolerance, the T16 is ideal for thousands of applications in robotics, medical devices and automation as well as DIY projects. We're always on top of what's happening in the linear motion industry. We've been noticing a demand for micro track actuators for some time now. This is for a variety of reasons. Micro linear actuators, although incredibly useful, fall short in a couple of key areas. By design, linear actuators are quite long as the shaft needs space to retract into the actuator. Track actuators are significantly shorter for the same amount of travel, effectively saving space in your project. Track actuators excel in another key area - side loading. Micro linear actuators are only tolerant to minimal side loads. Track actuators are ideal for applications where there is going to be a more significant side load on the device. Currently, there are 18 new models of track actuators available. They're offered in 100mm, 200mm and 300mm strokes. The 300mm track actuator represents our longest stroke product yet. They are offered with the same gearing options as our P16 line, 22:1, 63:1 and 256:1. As with our P16 lineup, we're offering them as a -P or an -S series. The -P series offer analog position feedback the can be used with an external controller. These can also be used with our Linear Actuator Control Board, giving you the ability to control it via USB. The LAC board allows you to adjust speed, sensitivity an set stroke end-limits right from the board. You can buy the LAC board for half price ($20) with the purchase of a -P series actuator. The S series features end of stroke limit switches that will turn the unit off if run to the end of it's stroke. These can be controlled via a dual pole dual throw switch or relay. For use with radio control, you can use a brushed reversible DC motor controller. With 18 new models available, it may be challenging to choose the correct track actuator for your application. To help you out, here's a demo video showing you how fast our P16 actuators move with all three gearing options. If you have any questions about this new line, or need help choosing the correct device for your needs, call or email our sales department via our contact page. We will be happy to assist you. What Are Micro Linear Actuators? If you're new to the world of robotics, you might be wondering "what are micro linear actuators?" Simply put, they are small devices that convert rotary motion into linear motion. They work in much the same way as large-scale actuators, but are physically smaller in size. This makes them more suitable to tight spaces and applications where weight must be kept to a minimum. There is no hard and fast rule for what makes an actuator 'micro' but generally speaking, micro linear actuators have a stroke of less than 300mm and offer less than 100lbs of maximum force. You'll find these devices in thousands of applications across dozens of industries including robotics, aerospace, medical devices and radio control. 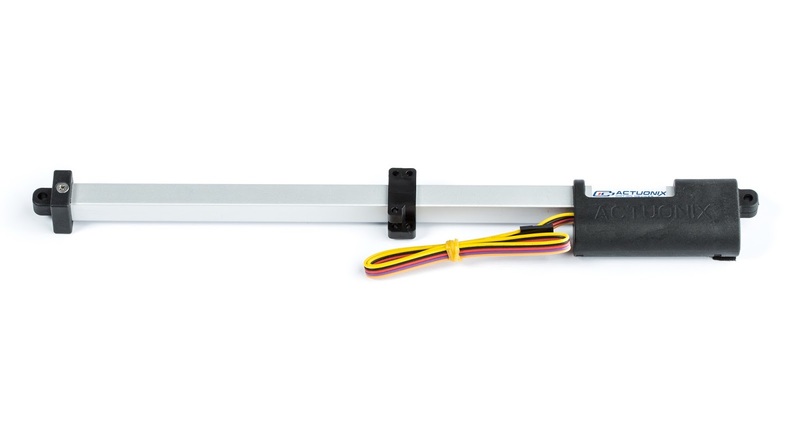 RC linear servos are also compatible with arduino and thus becoming more popular with the DIY crowd. Of course the main benefit of micro linear actuators is their relatively small size. Size, weight and cost restrictions have kept linear actuators out of consumer products for a long time. Actuonix changed that in 2005 with the development of the first affordable, reliable micro linear actuator. Electric micro linear actuators are slowly replacing pneumatic and hydraulics as the preferred solution for all types of automation applications. The main advantage of Actuonix micro linear actuators is their tiny size. They're also very simple to mount compared to standard rotary hobby servos. Our micro linear actuators are also capable of higher forces. With max forces of up to 67lbs, Actuonix devices have the power it takes to drive your projects. Side by side actuators tend to be more powerful due to the added space for a larger motor. They have a larger cross section but also have a shorter installation length, which can be better for some applications. The shaft of a miniature linear actuator can be either circular or square in shape. They will typically be constructed of aluminum or another high-quality metal. There are exceptions here, our PQ12 is constructed of plastic and is tough as nails with a max force of over 11lbs! Micro linear actuators and linear servos are very similar and the term you use can depend on the industry you're working with. R/C and robotics hobbyists will be more familiar with the word 'servo' as rotary servos have been popular in those spaces for many years. The term actuators tends to be used more by industry and the scientific community. For the purposes of this article, I'm referring to all products as 'actuators' with the exception of our 'R' series, which is a direct plug-and-play replacement for rotary servos. 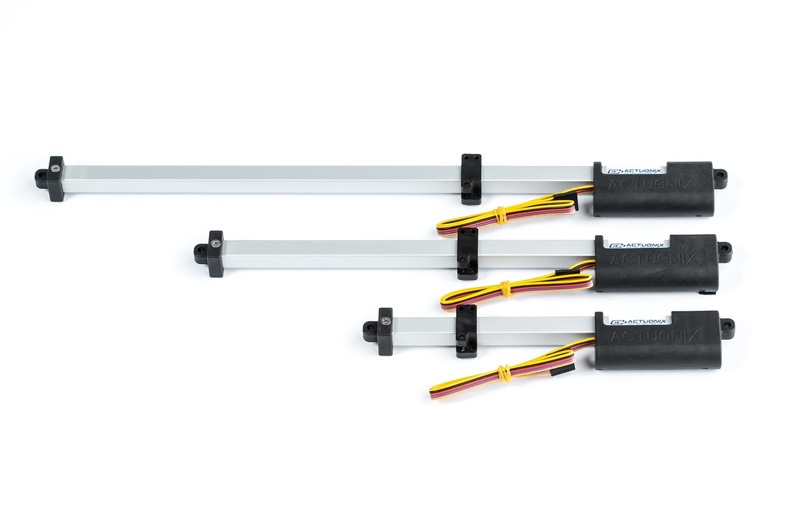 The 'R' series are micro linear servos. Most micro linear actuators are a simple 2-wire 12v device that is operated by reversing the polarity of the applied voltage. Simple and effective. This is great for some basic automation projects. Actuonix Motion Devices leads the micro motion industry when it comes to control options. We offer 4 different control options off the shelf to better accommodate the needs of our clients. Our S series is the simplest micro linear actuator that we offer. As described above, they use a 6V or 12V input and are controlled by reversing the polarity. Our S series actuators come with end of stroke limit switches to prevent motor damage. The P series micro linear actuator, has an internal position feedback sensor instead of limit switches. This sensor allows you to connect a position controller of your choice to automate the actuator. We offer a control board called the LAC board which allows you to adjust the speed, set end limits and adjust the sensitivity. Our R series linear servos are a direct plug-and-play replacement for regular rotary servos. They will work with most R/C receivers as well as arduino, VEX and Raspberry Pi. The I series micro linear actuator has an embedded internal position controller that will allow you to send a variety of position commands which the actuator will follow. Designed for the industrial and scientific market, it can accept an analog voltage, PWM voltage, 4-20 mA current from a PLC, and RC signal inputs. What are Micro Linear Actuators used for? The potential applications for micro linear actuators are endless. Any project that requires linear motion but has space or weight restrictions is an ideal candidate. Below, I've listed a few examples of industries or groups that commonly use micro linear actuators to give you an idea of how versatile they are. Robotics – OEM companies and hobbyists alike use micro linear actuators in everything from mass-produced robotic hands to carefully-crafted, home-built R2D2 models with full functionality. Arduino – Our micro linear actuators drive thousands of arduino projects from animatronic Christmas and Halloween displays, to auto-closing chicken coops. Start with stroke. Measure how far you need the actuator to drive to accomplish your goal. Next is force or speed, how much force do you need or how fast does it need to move? Remember these two factors are linked because for any actuator the more load you add, the slower it will go. Use our speed vs. force charts to pick the gear ratio that is most suitable for your application. Now that you have a good idea what you need in terms of physical capability, you need to decide how you will control the actuator. Do you want a basic 12V reversing polarity setup, or do you need to control your end limits. Do you plan to use arduino? If you need help choosing the correct micro linear actuator for your project or product, send us an email or call our sales department and we'll be happy to help you choose the micro linear actuator that will best suit your needs. 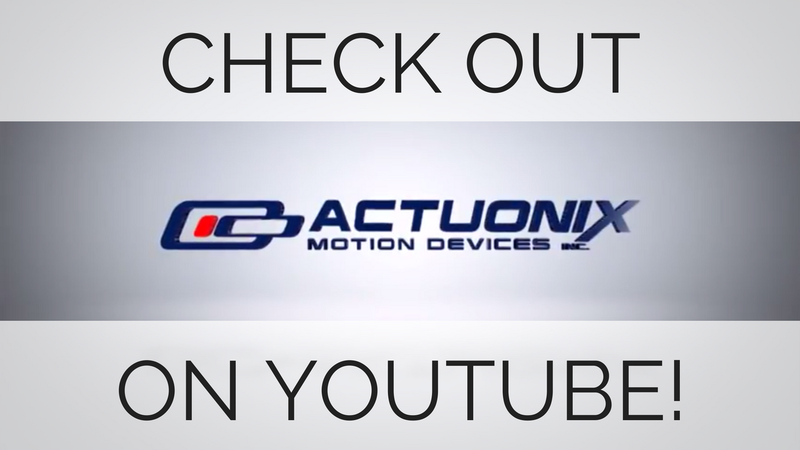 Why Choose Actuonix Motion Devices? Actuonix Motion Devices (formerly Firgelli Technologies) has been a leading manufacturer of micro linear actuators and servos since 2005. All of our products are designed from scratch, by our in-house team of engineers. We pride ourselves on providing affordable, quality micro-motion solutions to a wide variety of industries. Whether you're designing a new product for an OEM company or customizing a scale RC model, we're confident that we can offer you the right linear motion solution for your project. With over 145 different models, we have the widest variety of products in the industry. We offer strokes ranging from 10mm-300mm and forces up to 67lbs. In addition, we have 4 different series of actuators with different options for control. This means that whether you're using an RC receiver, an arduino, VEX, a custom controller or simple reversing polarity, we've got the right actuator for your project. Need something to work with a PLC or your DAQ? We've got you covered there too. You don't need to waste time trying to make the wrong product work for your application. With more than a decade in business, our engineers are world-class professionals at developing linear motion devices. Constantly on the hunt for new ways to improve on design and functionality, our products are load-tested to failure to make sure that everything we sell lives up to your expectations. We also test every single actuator for quality before it leaves our facility to make sure that you're getting a device that will last. Actuonix offers customer service by email or phone from 7:30am-3:00pm PST. Our trained sales and support staff know our products inside and out and will help you choose the best device for your application. We also offer our customers bulk discounts for orders of more than 10 actuators, as well as student discounts for actuators that are shipped to an educational facility. Are you on a FIRST robotics team? Our line of linear actuators is FIRST compliant to get your machine moving for the next competition. With a knowledgeable team and products that have stood the test of time, we're confident that Actuonix is the right choice to make your project move. For more information, contact us today!